A teary journey from Kauvery to Gopalapuram! Sri Ramachandra Murthy August 8, 2018 11:31 IST A teary journey from Kauvery to Gopalapuram! DMK chief Karunanidhi had passed away today, at the Kauvery hospital where he admitted for the past 10 days, and after his death was announced, his body was brought to his Gopalapuram residence in Kauvery hospital ambulance. Party members and loyal followers of Karunanidhi had gathered around the ambulance, bringing the body with teary eyes to Gopalapuram. The usually humorous senior leader of DMK, Duraimurugan had been very sad, in one of the most disturbing sights of the day, as he was deeply saddened by the loss of his leader, as he came sitting in the ambulance carrying him. As Karunanidhi arrived in a glass box, followers of the legendary politician were gathering around Gopalapuram residence thronging in large numbers. 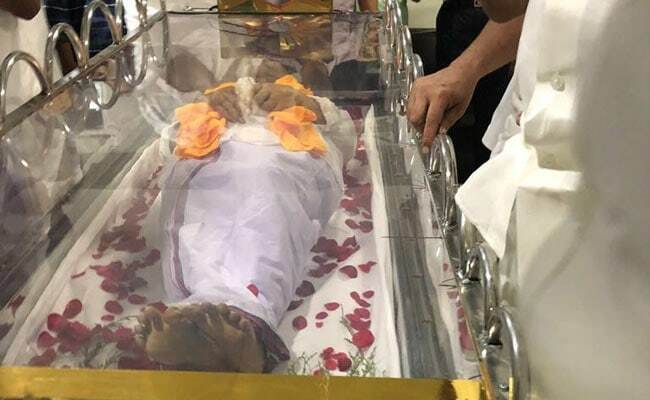 Karunanidhi's body will be placed in the Gopalapuram residence where he had lived, till 1 pm, following which he was taken to CIT colony residence.